Special events including the Garth Brooks concert and NHL Winter Classic have made for a football-like atmosphere in and around Notre Dame Stadium in recent months, translating into increased business for local hotels — and increased economic activity in the community as a whole. Brooks performed to a sold-out crowd at the stadium on Oct. 20. It was the first-ever concert in the historic venue. 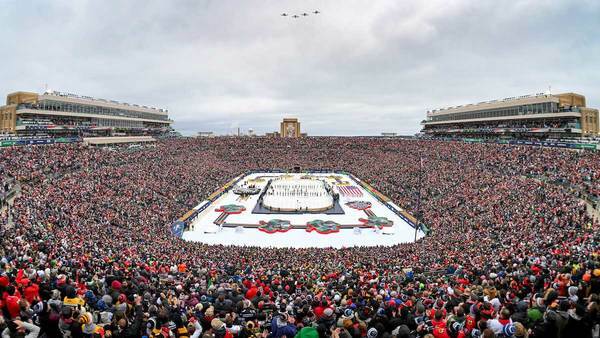 Another sellout crowd watched the NHL Winter Classic there on Jan. 1, in a nationally televised game featuring the Chicago Blackhawks and Boston Bruins. Hotels and other local businesses. According to Visit South Bend Mishawaka, hotel occupancy in the county was up more than 300 percent year-over-year on Dec. 31, the day before the Winter Classic, and more than 160 percent on Jan. 1, with average daily room rates up more than 100 percent on both days. Revenue per available room, a common measure of performance in the hospitality industry, was up both days as well — nearly 700 percent on Dec. 31 and more than 400 percent on Jan. 1. The Garth Brooks concert also put heads in beds. Nearly all of the hotel rooms in the county were occupied the night of the concert, according to Visit South Bend Mishawaka, with average daily room rates and revenue per available room up considerably that evening as well. This despite a 10 percent increase in the overall number of hotel rooms in the county last year compared with the year before, highlighted by a new 164-room Embassy Suites at Eddy Street Commons and two new hotels — a 140-room Courtyard by Marriott and a 187-room Aloft — in downtown South Bend. In addition to hotels, visitors for the concert and Winter Classic, as well as a second hockey game between the University of Notre Dame and the University of Michigan on Jan. 5, spent on food, lodging, transportation and retail in South Bend and the surrounding community as well. A recent report estimated Notre Dame’s overall impact on the local economy at $2.46 billion per year, not including state and local tax revenue from student and visitor spending. Football alone generates an estimated $185 million per year, or about $26 million per game, in impact for the local economy. “Anything big like that at Notre Dame is going to affect the entire city, and that’s great for us,” Waymire said of the concert and hockey game. The University recently completed a massive renovation of Notre Dame Stadium, transforming the 89-year-old facility into a year-round hub for student and academic life and a world-class venue for large-scale concerts and other special events. Moving forward, the University plans to host two to three such events at the stadium each year. Originally published by Erin Blasko at news.nd.edu on January 22, 2019.